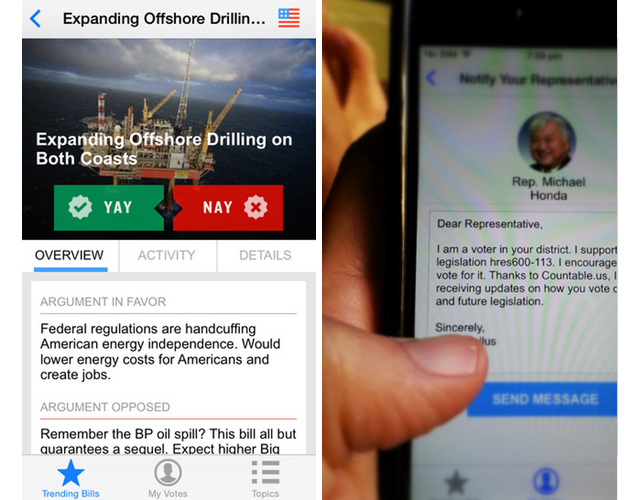 Countable is a political app that allows you to track important and trending legislation on your iPhone. The app is designed to make government accessible to the average citizen by explaining legislation in understandable terms. There's also a social side to Countable that provides the ability to voice your support or opposition to a bill as well as track your representatives to see how close their votes match yours. .
Countable has two main objectives. First and foremost, it allows people to follow bills as they make their way through the legislative process. You can quickly view trending bills that are up for vote or making headline news because they are controversial. You also can explore less popular bills that are organized by topic. All this information is available without a login and is accessible by clicking on "Login Later" link at the bottom right of the launch screen. Besides tracking bills, Countable also allows you to participate in the legislative process by providing the ability to virtually vote on legislation. You can track your representatives, view their voting records and send them emails that voice your opinion on bills. Unfortunately, this portion of the app requires a login. The login option is understandable as it is used to save your voting history, but the only login option available is Facebook. Many users, myself included, are hesitant to share my Facebook credentials with any app, especially one of a political nature. Overall, Countable is a wonderful tool for anyone who wants to follow important legislation without having to wade through the legalese wording of the bill itself. The voting side is crippled by a Facebook login, but hopefully a future version of the app will open that up to alternative login methods, such as email. Despite this limitation, Countable is worth the space on my device if only for the concise summaries of the legislation that is making headlines. Countable is available for free from the iOS App Store. It is available for the iPhone and requires iOS 7. Update: Countable reached out to me with the following information about the Facebook login requirement: "Countable is already working on an email login, so users will not have to use Facebook. It was something a bunch of users mentioned, and the team behind Countable listened."